I wanted to start the new year off with posting something sweet and I couldn't think of a more sensational dessert than this pear and almond tart. It's sure to impress your family or friends, and it's not as difficult to make as you may think. I love anything that can make in stages, and this tart can definitely be prepped ahead of time. The pears and the pie dough can both be made days ahead, making baking day quite simple. 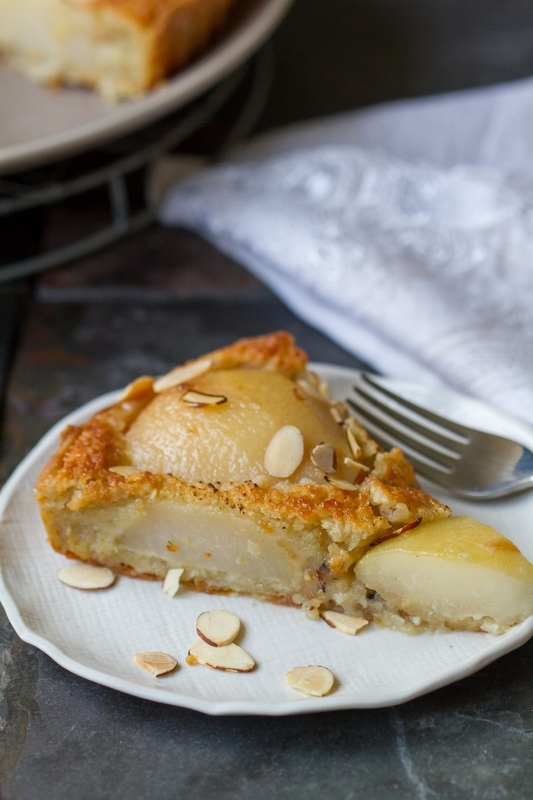 This is a beautiful tart filled with ground almonds, lightly spiced pears, and splashes of Calvados for extra flavor. Enjoy! Combine all the ingredients except the pears in a large nonreactive saucepan and bring to a simmer for about 15 minutes. Meanwhile, peel the pears, cut them in half lengthwise and remove the cores. Place the pears in the simmering syrup and cook until tender, about 15-20 minutes. Test by piercing one with a paring knife; it should offer very little resistance. Remove the pan from the heat and allow the pears to cool in the poaching liquid. Once cooled, discard the cinnamon stick and vanilla bean. The pears can be stored in their liquid, in the refrigerator for up to 3 days. Spray a 10" tart pan with a removeable bottom lightly with a cooking spray such as Pam. Into the bowl of a food processor with the blade attachment, add the flour and salt. Add butter and pulse until its the size of small peas. Slowly add the egg and water. Pulse only until the dough begins to come together. You may have to add another tablespoon of water if it's too dry. Don't overwork the dough. Remove from the processor and gather it into a disc, cover in plastic wrap, and let it rest in the fridge for at least an hour or up to a couple of days. On a lightly floured surface, roll the dough into a 12" circle. Transfer the dough to your tart pan and trim the edges. Put on a cookie sheet, cover with plastic wrap and place in the refrigerator until you are ready to bake. In the bowl of an electric mixer with the paddle attachment, cream the butter and the sugar on medium speed until light and fluffy. Reduce the speed to low and add the egg, almonds, flour, Calvados, and almond extract. Beat until smooth, about 2 minutes. Pour this mixture into the chilled tart shell and spread it evenly. 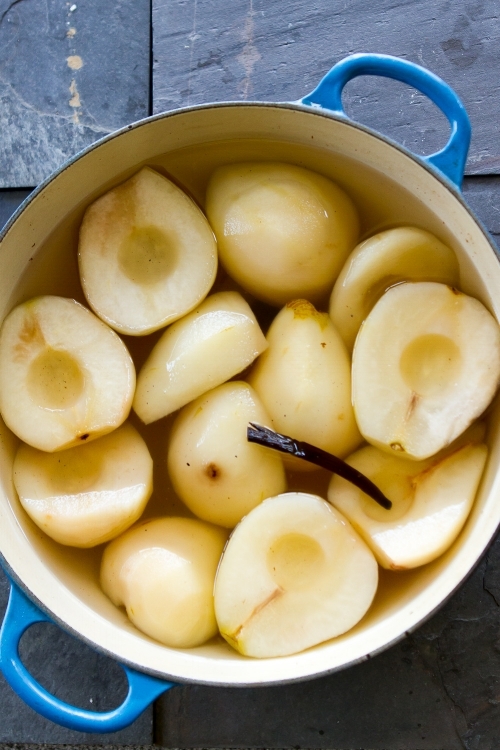 Remove the pears from their poaching liquid and place in a colander to drain. Set aside 1 cup of the poaching liquid. Place the pears cut side down close together on the tart with the narrow tops facing inward, until the entire surface of the tart is covered. Bake until golden brown, about 45 minutes. Meanwhile, in a small saucepan over high heat, bring the reserved poaching liquid to a boil until it is reduced to about 3 T. Set aside. Remove the tart from the oven, and while still hot, brush the pears with the reduced poaching liquid to give them a sheen. Recipe slightly adapted from Frank Stitt's Southern Table.